We are looking for sweet corn growers to participate in our 2017 Vegetable Field Day and Sweet Corn Tasting. Our field day on Aug. 15 at Pinney Purdue Ag Center in Wanatah, will feature tours of tomato production in moveable high tunnels, using both conventional and organic management systems. The event also will include walking tours of sweet corn and pumpkin variety trials, an overview of research findings about the opportunities available through high tunnels, and information about the NRCS program. Attendees will learn about managing pollinators; low-cost high tunnel structures for the home gardener; irrigation solutions; site and structure considerations for new high tunnel users; and finding, preserving, and preparing fresh produce. Private applicator recertification credits (PARP) are anticipated. 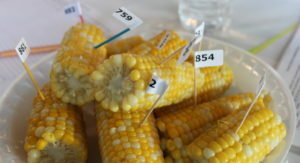 This event includes a dinner and sweet corn variety tasting. If you would be willing to donate 2 ½ dozen ears of corn, please contact Lyndsay to arrange pick-up/drop-off arrangements. Lyndsay Ploehn, Purdue Extension—Porter County, Agriculture & Natural Resources Educator. (219) 465-3555 or lploehn@purdue.edu.